From native daughter and well-known feminist Greer (The Whole Woman, 1999, etc. ), a provocative essay insisting that Australia can achieve political maturity only when its white citizens transform their whole way of thinking about themselves and their country. Though she now teaches and lives in England, the author still spends four months a year at her home Down Under. Her confrontational message to white Australians: first, admit that Australia is an Aboriginal country; second, confront the fact that you were born in an Aboriginal country and must therefore be considered Aboriginal. Think of Aboriginality not as a race but as a nationality, she counsels. Becoming Aboriginal, to Greer, means acquiring knowledge about the land and the relationship of human beings to the land, the kind of knowledge that Australia’s “blackfellas” possess—or at least once possessed. The places, names, and specific events in Greer’s chronicle of Australia’s exploitive history will be unfamiliar to most Americans, but the story of unequal relations between white settlers and an indigenous people transcends the particulars. The author would have Australia recognize that colonization was a failure and that the republic must no longer act as “a puppy running alongside the US and Britain,” but as a leader among postcolonial countries. Looking to Australia’s future as “a hunter-gatherer nation,” she envisions not a stone-age way of life but a forward-looking attempt to work for sustainable development while preserving fragile ecosystems, precious water resources, and threatened species. Originally published last year in the Australian journal Quarterly Essay, Greer’s piece appears here accompanied by commentary from Quarterly editor Peter Craven and nine Australian writers, who variously interpret, attack, argue with, and occasionally praise the author, her ideas, and her way of expressing them. Greer responds to her critics in a pungent closing essay that further expounds on her thesis about Aboriginality and its value to a society burdened with guilt and suffering spiritual desolation. 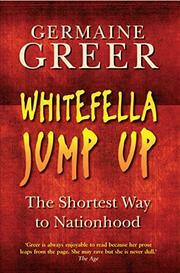 Hard knocks for Australian “whitefellas,” though perhaps less compelling for American readers.